‘Caravellis Foxtrot’ by Han Beuker & A. De Kloek-Beuker. Publisher not mentioned, but likely the Mignot & De Block company from Eindhoven, The Netherlands (s.d., illustrator unknown). The Caravellis Foxtrot was meant to promote cigarettes with that brand name. 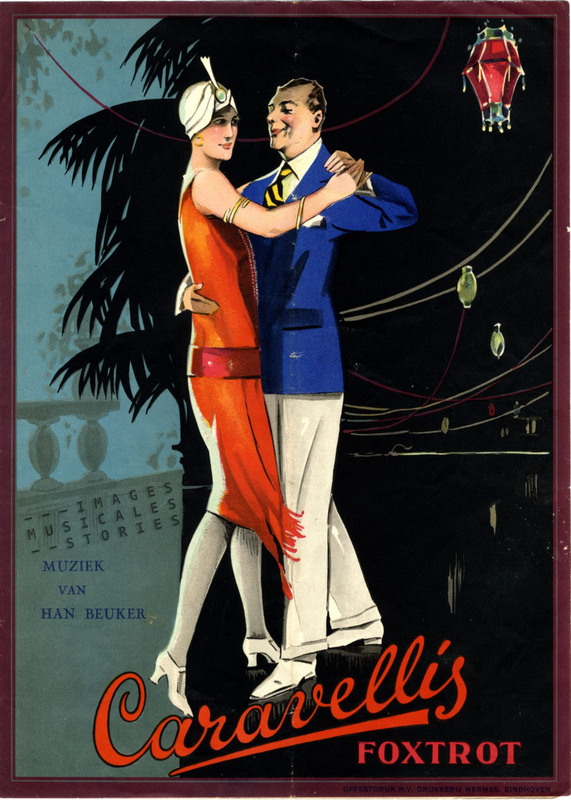 The expensive sheet music edition and the drawing of the elegant dancing couple strongly suggests that the publicity targeted a sophisticated (rich) public. 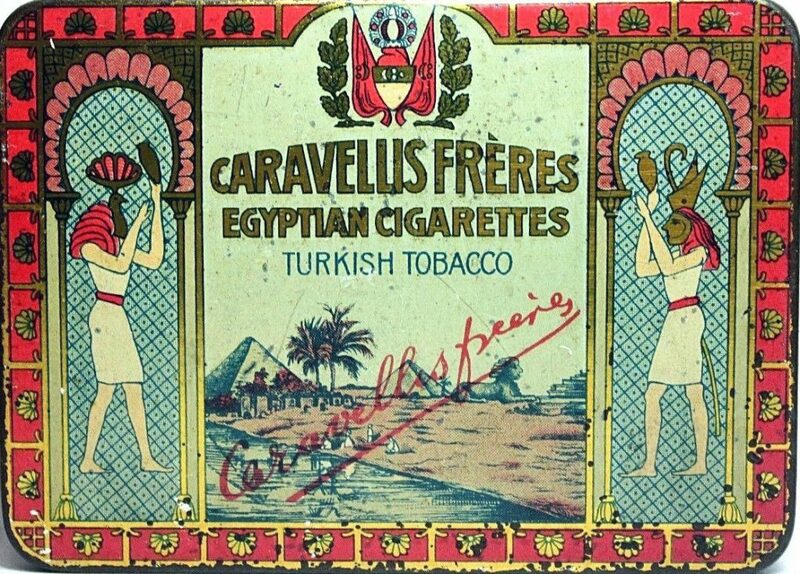 Even if the name suggests otherwise, Caravellis Frères was the trade name of a Dutch company that manufactured Egyptian-style cigarettes. 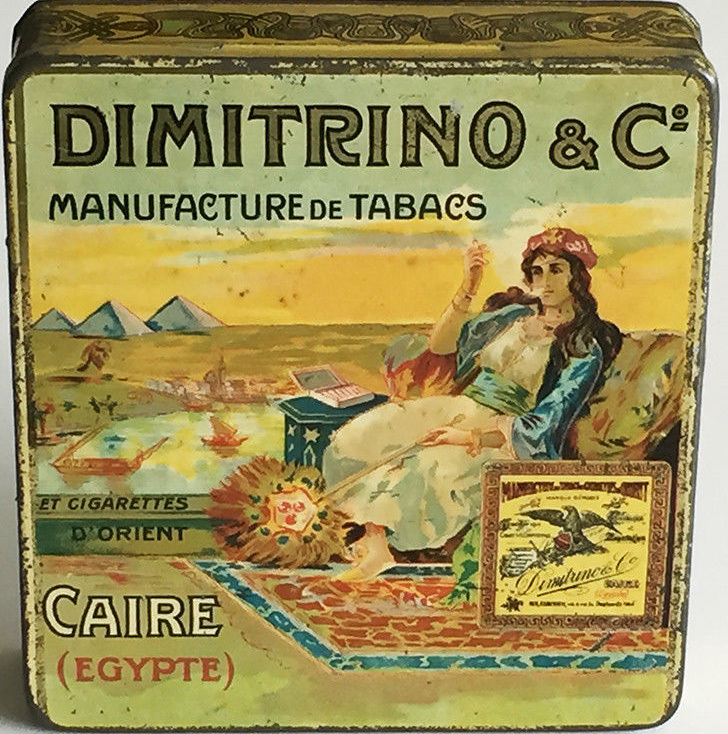 At the turn of the century real Egyptian cigarettes, manufactured with Turkish tobacco in Egypt, were very popular with the richer part of the population. The production was predominantly done by Greek manufacturers who imported the tobacco from ‘Ottoman countries’ and created blends with ‘exquisite taste’. These Egyptian cigarettes were promoted as handmade, exclusive luxury items. And they were expensive. Accordingly the cigarettes were packed in colourful eye-catching boxes or tins. They were easily recognisable by their Egyptian iconography. This tin of Dimitrino cigarettes for example presents us an exotic scene of a lush woman lazily enjoying her smoke with a view on the Nile. Other visuals for Egyptian cigarettes used architectural elements, sculptures or drawings from the land of the Pharaohs. 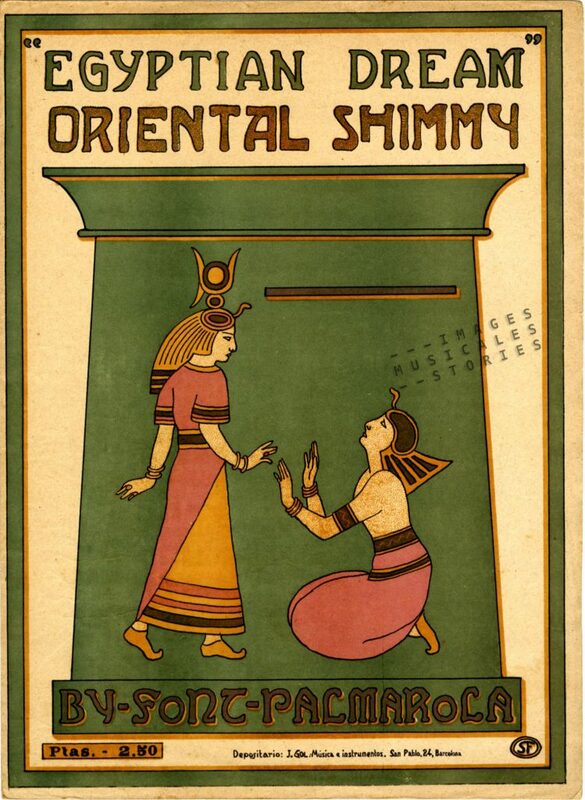 The same iconography was being used on the covers of ‘oriental’ sheet music of the same period. 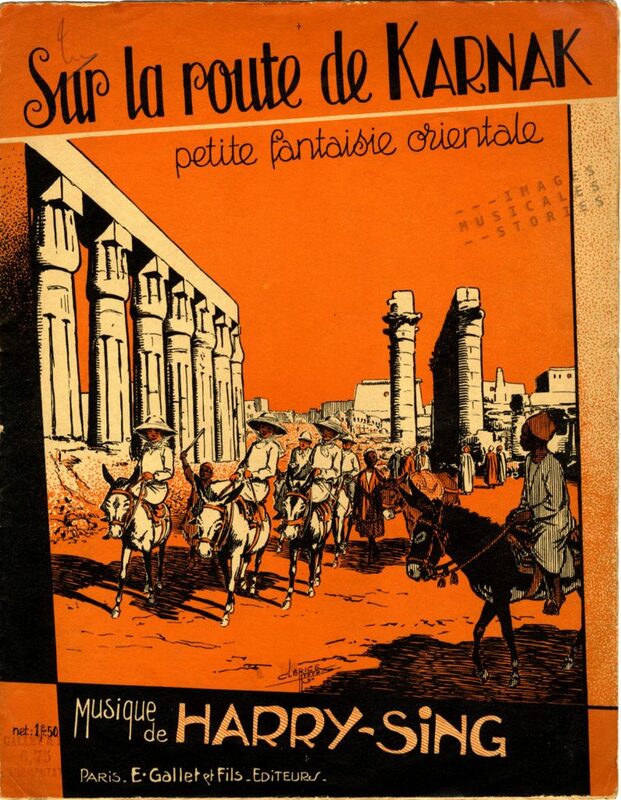 The development of the tourist industry in Egypt promoted the Egyptian cigarettes. The well-to-do tourists brought the blended tobacco sticks home and thus introduced this novelty to the Western world. ‘Sur la route de Karnak‘ by Harry Sing, published by Gallet & Fils (Paris, 1930) and illustrated by Clérice frères. The success of the Egyptian cigarettes prompted imitations all over the world. In the US these Egyptian-style copy-cats were mostly manufactured by (again) Greek entrepreneurs. No doubt, the most successful brand of these imitations was Camel. Not owned by a Greek, Camel cigarettes were no longer handmade and sold at an unbeatable price. Thanks to a teasing ad-campaign they stopped all competitors dead in their tracks. 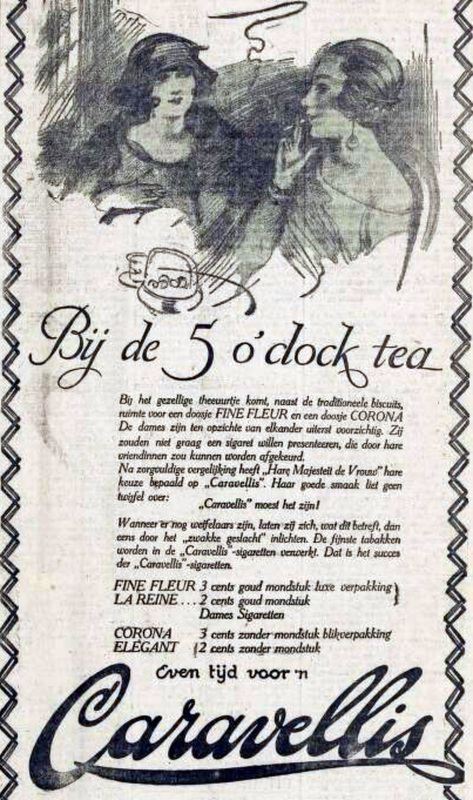 In Holland a Dutch tobacco company, Mignot & De Block, produced Egyptian-style cigarettes using the name of a Greek-sounding manufacturer ‘Caravellis‘. The French ‘Frères‘ (Brothers) added some finesse to the lended trade name. This shrewd company surely must have sponsored or published the ‘Caravellis foxtrot‘ sheet music that appears at the start of this post. Caravellis sold their cigarettes in tin boxes, with the typical ‘Egyptian look’. It gave an exotic and luxurious atmosphere to the smoking of Caravellis cigarettes. Tin of Caravellis Egyptian cigarettes. The refined packaging came hand in hand with clever advertising, such as this from a 1925 newspaper. To encourage customer loyalty Caravellis offered cigarette silks as a promotional gift. 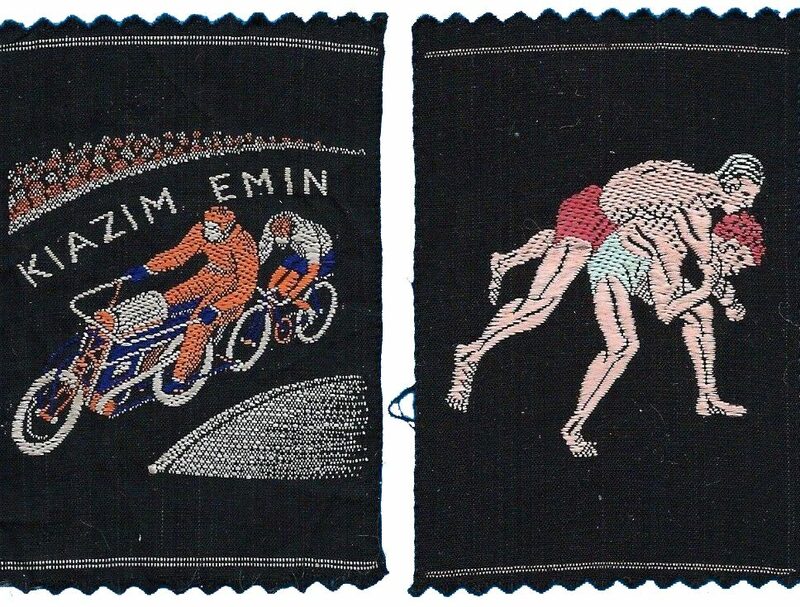 At that time it was common for tobacco companies to offer these ‘tobacco silks’ (or zijdjes in Dutch). They were small pieces of printed or woven satin, almost never silk, given away for free inside each packet or box. Sometimes the cigarette pack included only a coupon that one could trade for a silk. Mostly these silks were published as sets: images of beautiful women, flowers, birds, butterflies or sports. With the outbreak of the First World War military themes became all the rage. Inevitably, customers were urged to acquire albums in order to loyally collect the sets (and continue to buy Caravellis). Tobacco silks from Kiazim Emin, another brand of Egyptian cigarettes during the Twenties. 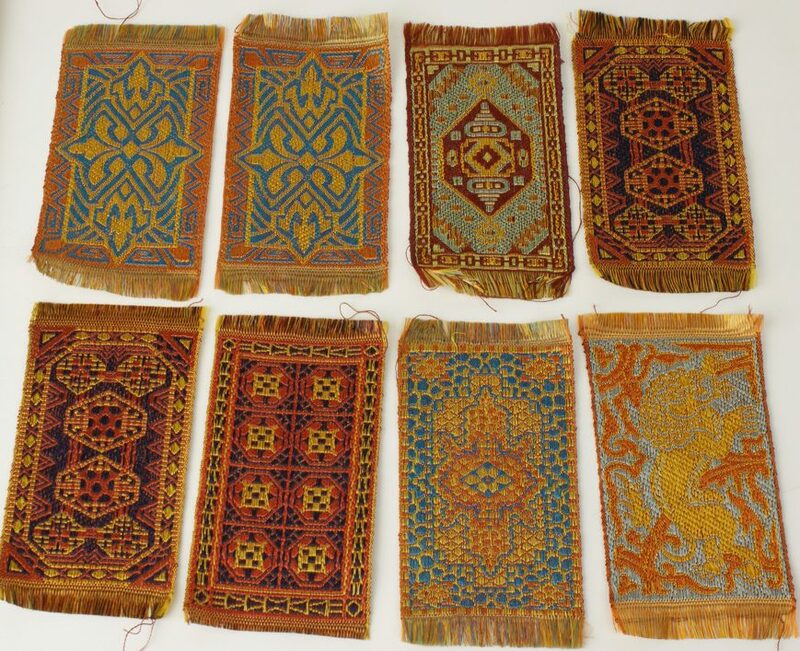 But the Caravellis tobacco silks were rather unique in that they were miniature woven Persian rugs, nowadays collected as doll house carpets. Tobacco silks from Caravellis: miniature Persian rugs. Source: Europeana collections. The silks were popular during the Twenties amongst housewives who used to sew together the small silks into larger textiles such as tablecloths. Or one could get creative, and use the silks to decorate whatever came to mind. 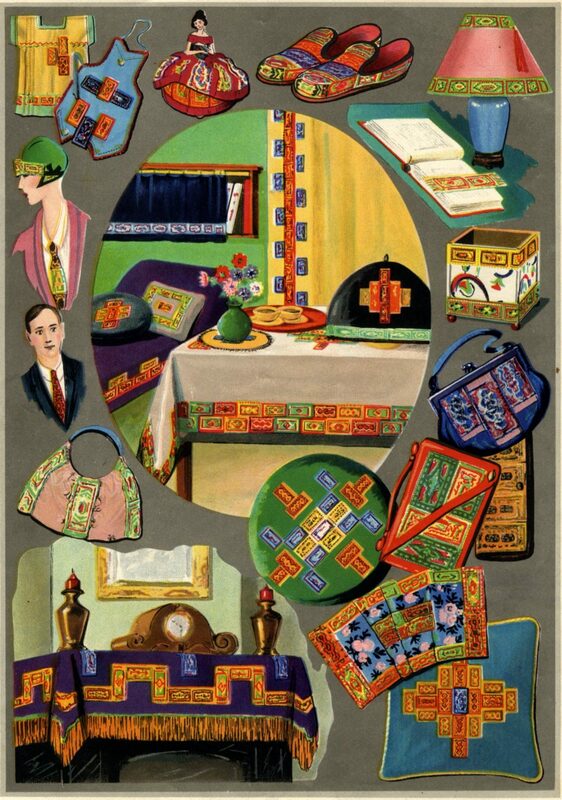 If a house lady should ran out of ideas, she then could get inspired from the back cover of the sheet music, and start to decorate lampshades, hand bags or slippers… Exciting! Back cover illustration of ‘Caravellis Foxtrot’. Wederom een mysterie opgelost dankzij I.M.